Googling "Fixing the Cleric" in quotes give ca 17900 results. Obviously, this is a recurring theme of frustration among D&Ders. So here is take 17901 trying to do the same. Why this keeps coming up is not hard to see - There are no clerics in fiction. It doesn't match to any sort of narrative archetype. The only archetypes it is recognised as is gamist: "the healer". As it is, it falls squarely between the two stools of religious warrior (which is the Paladin) and Mystic (which doesn't really exist in D&D). It's not that divine classes themselves struggle with this. Paladins are an easily recognisable archetype, as are druids. Yet, somehow clerics seem to expertly evade narrative recognition after decades of being a core class in D&D. 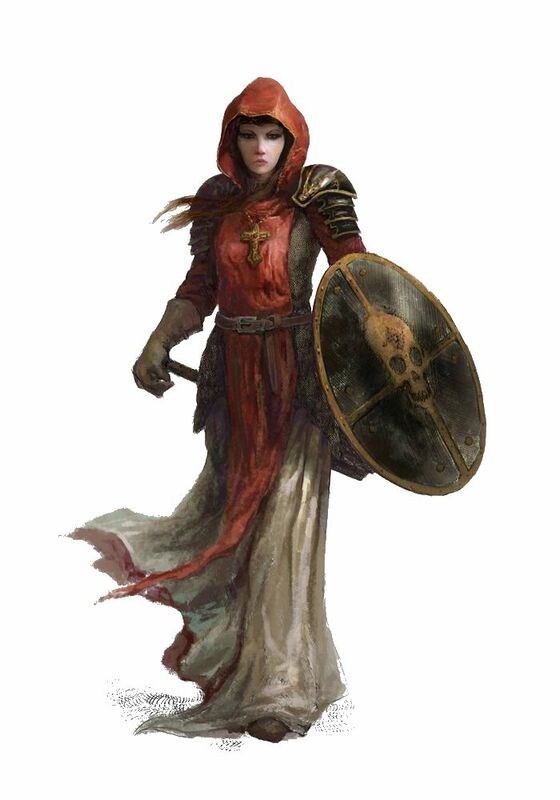 Maybe if they had made the cleric more like the monk, using simple weapons and little armor but being somewhat capable in melee anyway and then jazzed that up with clerical power, it could have fit in as a martialised monkish mystic type. Shaolin monks is a recognisable archetype. Friar Tuck with spellpower would have been a recognisable archetype too. I am frankly amazed that D&D never went this route but instead have persevered with this gamist cocktail of 'heal/turn undead and other assorted things'. Clerics are basically fixers of all the gaps in the others classes. It is tempting to make a class like this. I might at some point. I think it'd be much easier for players to grog. Nonetheless, since one of the design goals of Erce is to be inclusive of D&D tropes, it should be able to make sense of the cleric we all know and tolerate. In other words, finding the narrative niche of the Cleric and establishing what archetype(s) the cleric could be. Finding out how a cleric would make sense in fiction the way it makes sense as a gamist 'fixer'. Actually, though often overlooked, the Cleric is not just a mix match of a abilities a group needs that other classes don't have. It fills a clearly defined niche that most gamers tend to look elsewhere for: The Gish. Full spellcasting power - Check. Martial Ability - Check. Assorted abilities to more than just fighter/wizard - Check. No doubt about it - Clerics are easily the most well-designed gish in the history of D&D, welcome at any gaming table. With that in mind, we can try and ask what kind of archetypes match that. One very recognisable one comes to mind: The Jedi Knight. He fearlessly strolls into combat with a melee weapon. But really, he is more about the supernatural powers he brings to combat. And out of combat, he's about the mystical powers and bend wedded to a specific philosophy that demands more of him than his fellow men. Was that a Cleric or Jedi I just described? Same niche really. Though from science fiction, the Jedi is a mythic type of hero that can easily be put in leather armor and runes and fit into fantasy fiction. And in fact, has parallels in Sword & Sorcery fantasy too. Don't think Friar Tuck or Archbishop Turpin when making a cleric - Think Elric of Melniborne and similar Moorcockian Champions, albeit a bit less unique. For OD&D, where you are a cleric of Law or Chaos moreso than a god, making clerics the Jedi of D&D is a very simple fit really. This is basically how Law/Chaos clerics ought to have been envisioned from the outset - As mystical champions of a metaphysical cause. Since Erce is already heavily embedded with Law and Chaos as a defining paradigm, this is an easy insert really. Clerics are Law Jedis. Straight up. No alterations needed. But what about gods? Making sense of the cleric requires making sense of them as clerics of gods since really, this is what players think of for a divine class. All clerics have a divine patron. Or several. They receive their power not directly from the god, but through the god. When bonding with a deity to become a champion of Law or Chaos, your divine patron(s) is like a conduit - A prism through which Law is apprehended and drawn from. A cleric of course has a relationship with his god. And his views on the metaphysical cause he champions is no doubt shaped by it. But ultimately, he is beholden to their common cause and not the deity itself. This take on the cleric also adds another crucial dimension for gaming: Agency. For me, it has always been iffy to navigate the waters between 'what I think my player should do' and serving the will of your god. Ie 'what the DM thinks my player should do' - And no one really wants to serve the DM. With this setup, which is really more collaborative (gods champion and represent Law on a cosmic scale, Clerics on an earthly scale) Clerics are left free to interpret their cause according to their own convictions, as their relationship with the god is really more of a case of mutual benefit and common conviction (although of course, the god may end up withdrawing sponsorship if it sees too little benefit and common cause). Though of course, there is room for a range of relationships. Igor of Lugin is something of a puzzle to his clerical peers due to his frequent blasphemies and the blatant disregard he pronounces against his patron in public, yet somehow Lugin continues to sponsor him. He must be doing something right in the eyes of his god. Conversely, Oragon of Etreos is ridiculed, even reviled, by his peers for being such a snivelling lap dog to his patron. His nickname is "the errand boy" and it is said he doesn't even relieve himself without prior approval from Etreos. Religious disputes then, are more philosophical in nature - Which god(s) most accurately, or most efficiently, reflects and embodies the cause of Law (or other cosmic principle(s) you may have)? Another question that somehow has never been been properly answered is: How does a cleric become a cleric? Answering this tells a big part of what kind of role they play in the setting. D&D seems to imply that it is really just a question of devotion and faith. A dull answer that paves the road for any local devotee to start turning undead and consequently make clerics equally dull. Where there is faith there are clerics basically. How utterly droll and not special. No. Some NPC class should fill that droll niche. Clerics are heroes. Champions. Their origin needs to reflect it. No one becomes a cleric. You can't go to sunday cleric school and become a cleric by simply applying yourself with real devotion and faith. That's wizards, those ungodly nerds who are essentially just metaphysical mathematicians. No. Clerics are chosen. The gods are always looking for the right candidates to sponsor. They can't just willy nilly sponsor someone, because to sponsor a cleric in the mortal realm is to give up part of its own power in the cosmic realm. Being gods, they spend a fair bit of time looking into possible futures to find the right candidates - Making sure the candidate will give them highest possible chance of a good return on their investment. Clerics are chosen for sponsorship by their patrons before they were even born. They are the childhood freaks who spontaneously casts sacred flame on the local bully without even knowing they could. Who worry their parents with their visionary dreams that has them waking up screaming at night. And all the downright strange portents that keep happening around him that only a skilled oracle would correctly determine as having the favour of a certain god. The patron god is an inescapable presence in the life of a cleric-to-be. Clerics who deny the fate chosen for them seldom live happy lives. Freak accidents (which again, an Oracle could tell you the reason for), visionary nightmares and a general sense of life being somehow just off tends to be the outcome. The morale is clear: Only when you embrace your destiny and become a champion of the cause, a cleric, will your life become meaningful. The act of actually becoming a cleric always happens face to face - When the cleric-to-be is ready to embrace his fate, the sponsoring deity sends an avatar of some form (usually in a temple where it is easier for them to manifest) to perform an empowerment that creates a bonding between cleric and deity - the conduit through which the cleric is imbued as a champion of Law. Thus, all clerics have personally encountered their patron god in the flesh at least once in their life. Ironically, though I talked above about how Sponsored Clerics of a Cause have more agency in interpreting their cause than mere god worshipping clerics, they had much less choice in choosing their sponsor and cause in life in the first place. Those dice were rolled before they were born. For similar reason, Clerics are not especially well integrated into the religious establishments. Since neither religious training nor education is a requirement, clerics often have a proclivity for the unconventional, even blasphemous, to the eye of the uninitiated. Likewise, the religious establishment is uneasy with the direct nature of the relationship clerics have with their god. The unlearned might start to think clerics speak directly on behalf of the gods even when it contradicts orthodoxy. Nevermind the fact that some do speak for their sponsoring gods (for 9th+ level clerics, casting Commune and Divination as rituals basically constitutes your daily meditative practise). When the religious establishments recognise a cleric they generally tend to try sponsor them. As the gods sponsors clerics in cosmic matters, so the temple sponsors them in earthly matters. Which is to say, attempt to assimilate them, train them and indoctrinate them into following their orthodoxy (or with a kinder spin: Give them opportunity to maximise their potential and make use the establishment to advance the will of the deity). For local temples, there is also some measure of prestige in having a cleric sponsored by that specific temple - That said, it is often an uneasy process, given the nature of how clerics are chosen. Some are chosen who have natural affiliation with orthodoxy, relish the opportunity and enrich temple life with their engagement. Others are chosen exactly because they will never be orthodox and can accomplish things the temple would never consider. For others still, the tug and pull of the establishment is just one of those things in life to be endured between working on what's really important. From the perspective of the establishment, managing clerics is often likened to herding cats. Although their merit is acknowledged, their means are a frequent source of frustration. Though rare, it is been known to happen that some clerics have been assassinated by their own temple due to the complete disalignment between the cleric and the temple's outlook. Above, I mentioned how gods invest some of their own power into a cleric when sponsoring him. This investment also gives the cleric some leeway in his actions - A god can sever their bond, basically removing all clerical powers. But in doing so, they permanently lose the portion of their power they have invested in the cleric. Such a thing is not done unless the cleric is becoming a major force for heresy in his god's name. Such 'severed' clerics are prime candidates to be adopted by other patrons whose affiliations may lie closer to the path the cleric has now gone down, since their bodies and minds are already highly moulded to channel and shape the mystic power of Law/Chaos. Sometimes, the cleric might of his own volition seek to have his patronage transferred to another god, whereby the cleric relinquishes the power of his patron, sending it back to the diety in question, so he can be imbued with the patronage of a new god. Depending on the sponsoring god so abandoned, this may or may not be a cordial affair. The Old Gods care little for piety or worship, and are more inclined to acknowledge sacrifices, gestures of respect and bargains. Clerical bonding is less holy affair and more pragmatic partnership between god and his earthly champion. Unlike the Old Gods, The Nine Gods of the New Order have formed an orthodoxy that encourage frequent prayer and temple worship, harnessing this to shelter humanity in the Divine Dominions. They demonstrate a conviction that each represent facets of Law, but that the Nine as a whole are a perfect representation of Law. Essentially, clerics of the Nine take all Nine as their sponsoring patrons, though they may be closer to one or two than the others (domain choice). Where the Nine represent aspects of Law, The Triune Goddess of the Hearthstone Church holds that true Law is a Unity - Which the White Goddess not only represents, but is. And furthermore, that Law is a principle, a light, that can be directly cognised and embodied the same way the Triune White Goddess embodies Law - Essentially, the path of the Triune Goddess transcends itself for its most accomplished champions who themselves becoming living embodiments of the Light of the Law. For patron and champion alike, their relationship culminates in selfless symbiosis and unity. Clerics of Law in Erce then, are sets of exclusive mystical fraternities for the select few - Chosen Champions of Law. They certainly differ on how to understand Law - Wars have been fought over these disagreements. The Old Faith is seen by clerics of the Nine and the White Goddess as hardly champions at all - more akin to warlocks who make pacts with otherworldly beings to further their own ends. Clerics of the New Order are seen by the Old Faith as saddled by doctrines and subservience. And by Hearthstone clerics as holding to a fragmentary understanding of Law that is sadly incomplete in matters of ethics and spiritual transcendence. Clerics of the Hearthstone Church are seen by the Old Faith and the New Order alike as almost ungodly. The notion of Unity with the Light of Law is unnerving and paradoxical to them both in the sense of seemingly bypassing your divine sponsor to channel Law directly (which, 'everyone knows', is impossible) and in the sense of becoming one with one's deity, essentially surrendering personal will. Yet there is a kinship between clerics that sets them apart from normal society. All of them know they channel the same mystic power as Champions of Law. Though they may disagree on the form this cause takes, it is ultimately a common cause. And all of them know they are chosen by cosmic beings for this task for a reason. They are going to make a difference in the world. As for clerics of Chaos - The less said the better. These vile creatures who give up their bodies and souls for personal power, betraying humanity to demonic princes and devil lords - No, not another word shall be spoken about these dark champions.